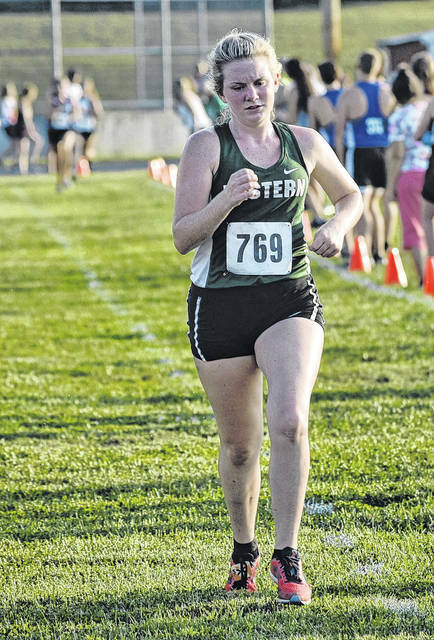 ALBANY, Ohio — The Eastern, Meigs, River Valley, Southern and South Gallia cross country teams competed at Spartan Invitational held Wednesday at Lake Snowden in Athens County. A total of 15 teams and 201 varsity participants competed in the event, with Athens coming away with both the boys and girls team titles. Both varsity races featured over 80 runners apiece, with 116 boys and 85 girls taking to the course in the separate competitions. Athens posted a winning score of 37 points in the boys race, finishing 24 points ahead of runner-up Trimble (61). Eastern’s Colton Reynolds posted the highest finish of local boys runners in the event, placing fifth overall with a mark of 17:46.94. 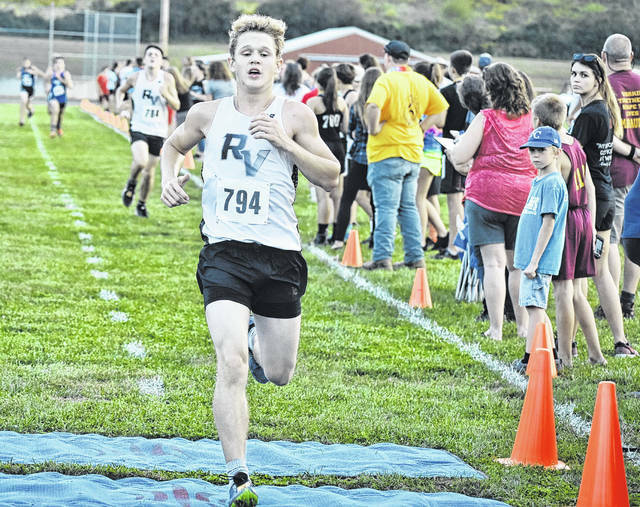 River Valley placed sixth overall in the team standings with 193 points, as Rory Tywman (18:57.58) paced the Silver and Black with an 17th place effort, while Cody Wooten (19:44.55) was next finishing 33rd. Caleb Mcknight (21:20.53) followed for RVHS with an 55th place finish, while Ian Eblin (22:33.66) was next with a 79th effort. Nathan Young finished 97th with a mark of 24:02.14 to round out the top-five finishers for the Raiders. Meigs placed ninth overall in the team standings with 237 points, as Colton Heater (20:01.19) led the way for the Maroon and Gold with a 37th place finish. Christian Jones (21:27.40) was next for MHS with a 58th place effort, while Tucker Smith (23:01.85) and Landon Davis (23:03.88) followed with 84th and 85th place finishes, respectively. 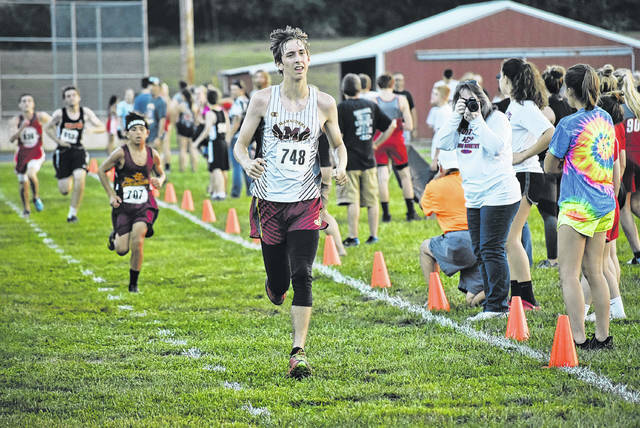 Jarod Koenig (23:19.64) was next with an 88th place effort, while Brandon Justis (30:34.40) rounded out the top-six efforts for Meigs placing 114th. The Rebels’ were paced by Garrett Frazee who placed 38th with a mark of 19:21.85, while Griffin Davis (27:53.88) closed out the SGHS top-two finishers with a 108th place finish. Tony Tonkovich of Athens won the boys race with a time of 16:29.30, with Eli Fullerton of Belpre coming in second with a mark of 16:30.39. Athens’ Cami Hibbard won the girls race with a time of 20:37.41, while Kaylor Offenberger of Waterford was the runner-up with a time of 20:39.74. Athens came away with the girls team title after posting a winning total of 36, while Warren was second with 72 points. Eastern (82) and River Valley (140) finished third and sixth, respectively. Rhiannon Morris was the top local finisher in the girls event, as she set the pace for EHS with a seventh place effort of 20:59.05. Ally Durst (22:23.96) was next with an 13th place finish, while Whitney Durst (23:51.15) followed with a 24th place effort. Lexa Hayes (24:24.01) and Ashton Guthrie (24:37.55) were next for the Lady Eagles with 29th and 30th place efforts, respectively. .
Alysa Howard (26:37.53) and Megan Ross (29:14.63) rounded out the top-seven finishers for Eastern with 52nd and 67th place efforts, respectively. 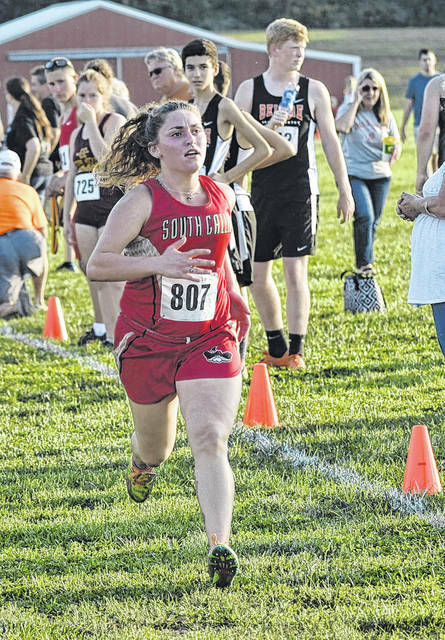 South Gallia was led by Jessica Luther who placed 53rd with a mark of 26:40.34, while Cara Frazee (26:43.85) rounded out the Lady Rebels’ top-two finishes with a 55th place finish. Southern’s lone representative Sydney Roush placed ninth overall with a mark of 21:59.59. Lauren Twyman (23:24.03) led the way for River Valley with a 20th place finish, while Hannah Culpepper (23:57.07) and Josie Jones (24:53.96) followed with 25th and 32nd place efforts, respectively. Julia Nutter (26:29.95) and Kate Nutter (28:36.92) were next for RVHS with 63rd and 64th place finishes, respectively. Connie Stewart (29:04.71) was next with a 66th place effort, while Lexi Stout (30:04.43) closed out the top-seven finishers for the Lady Raiders with a 71st place effort. For the Lady Marauders, Madison Cremeans finished 31st with a mark of 24:41.59, while Taylor Swartz rounded out the top-two finishers with a 42nd place effort. Visit baumspage.com for complete results of the 2018 Spartan Invitational.